DO-17100-11 was succesfully added to your cart. Air velocity instruments such as anemometers and weather stations need regular calibration to accurately measure and record environmental measurements. InnoCal’s state-of-the-art wind tunnel provides extremely accurate comparisons for wind speed, air flow, and differential pressure. InnoCal® services hot-wire and vane anemometers, manometers balometers, air capture hoods, velometers, and weather stations from leading brands such as TSI Alnor®, Extech®, Davis Instruments®, Fluke®, Testo, Sper Scientific, Biotest Hycon®, and many others. 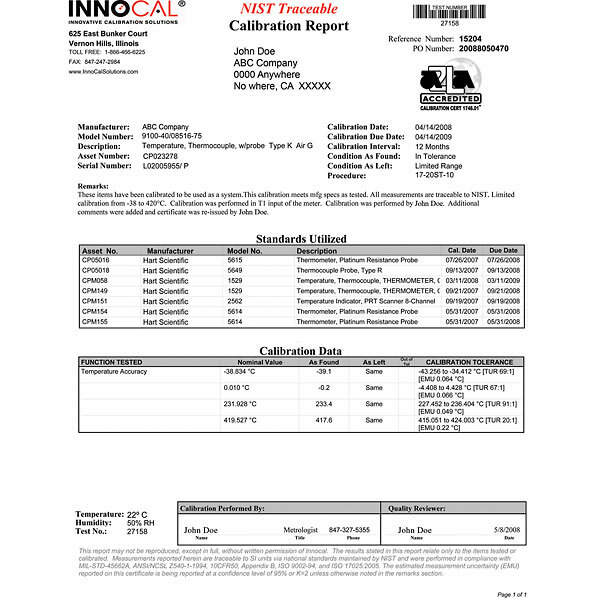 For your convenience, InnoCal also has the capability to calibrate the humidity, barometric pressure, and carbon dioxide functions of your devices to ensure that the full measurement capability of the instrument is fully tested. All measurements reported are traceable to SI units via national standards maintained by NIST and performed in compliance with ANSI Z540, ISO17025, and MIL-STD-45662A. InnoCal is accredited to ISO/IEC 17025 by the American Association for Laboratory Accreditation (A2LA) under certificate number 1746.01. This accreditation is your assurance that the calibration is performed in a qualified, controlled laboratory. Can you Calibrate a Kurz 490 or a Kurz 490-IS? Yes, we can calibrate the Kurz 490 unit. Can your service calibrate an Extech 407119A hot wire anemometer? Yes, we can calibrate that unit and this is the correct calibration service part number. Please call us to set up an authorization for a service return. can you calibrate a TSI 8355 velocicalc? Yes, we can calibrate the TSI 8355 anemometer. Can you calibrate a Mannix DCFM 8906 vane anemometer? Yes, this meter (37954-00) can be calibrated using a different calibration part number: 17101-01. Yes, we can calibrate the Alnor 8575. Can you calibrate a TSI VelociCalc Plus Model 8388 Air Velocity Meter? This unit has reached its "end of life." TSI is no longer servicing this unit, and their means of calibration is proprietary for this unit. Please contact us directly for any further assistance. We use in a clean room for hood verification. Not very durable. Didn't pass calibration after a year use. Had to replace probe.